I wish this post was about 100 Days of Summer but...I guess we have a while for that since the rodent saw his shadow this morning. Like we ever have an early Summer. The post is really about 100 Days of School. That is something to celebrate, isn't it? Well, they do at school. The elementary school, that is. I asked Meg how her 100th day of school was and I was grouchily informed that that was for elementary school and not middle school. Excuse me. For the 100th day of school Kade was supposed to bring in 100 of one thing. He chose marshmallows. He had a lot of other ideas but I talked him into something easy and cheap. 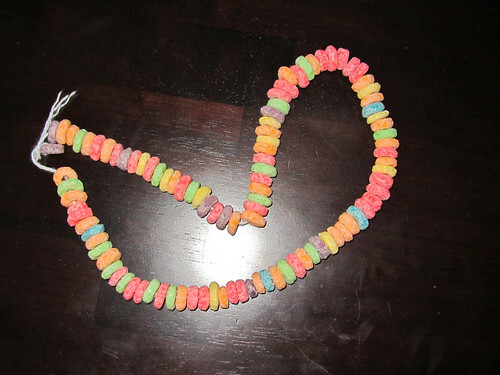 At school he made a necklace with 100 Fruit Loops. It smelled and looked good when he pulled it out of his bag. I almost had to eat it. I restrained myself because I'm sure that would have made him cry. Speaking of 100 things, I think Mickey has gone through about 100 Kleenexes today. He's got a bad cold. He stayed home from work but could not get the sleep he wanted and probably needed to recover.